AICN COMICS PODCAST: QUANTUM & WOODY! BALLISTIC! JUNGLE BOOK! 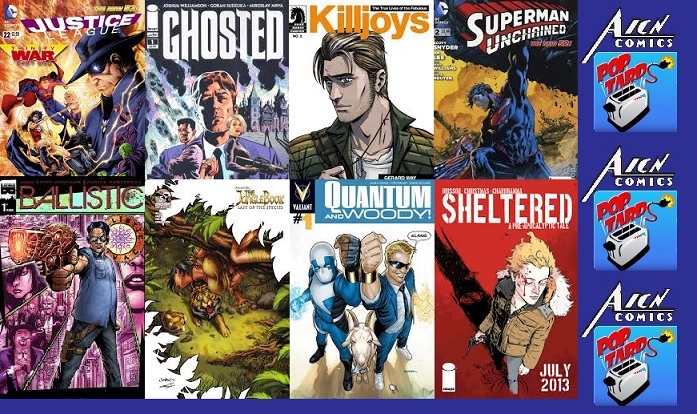 SUPERMAN UNCHAINED & MORE! AICN COMICS PODCAST: QUANTUM & WOODY! BALLISTIC! JUNGLE BOOK: LAST OF THE SPECIES! SUPERMAN UNCHAINED! & MORE! Ambush Bug here. The below hour-plus long conversation took place between myself, Optimous Douche, Matt Adler, and our host Johnny Destructo of PoptardsGo.com as we talked about QUANTUM & WOODY #1, BALLISTIC #1, JUSTICE LEAGUE #22, JUNGLE BOOK: LAST OF THE SPECIES #5, THE TRUE LIVES OF THE FABULOUS KILLJOYS #2, SHELTERED #1, SUPERMAN UNCHAINED #2, GHOSTED #1, listener emails, and of course, more general jack@$$$ery!